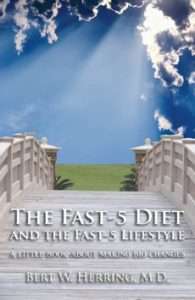 The Fast-5 Diet and the Fast-5 Lifestyle is a book about integrating intermittent fasting into a daily routine that gets appetite working like it should — reducing intake if you have excess fat and maintaining a healthy weight if you don’t. The Fast-5 rule is simple — eat within five consecutive hours. The book is about how to get started, what to expect, and how to deal with the challenges of eating in a way that’s not the social norm, but saves time, saves money, and is one of the most easily sustained choices for getting to and maintaining a healthy weight.